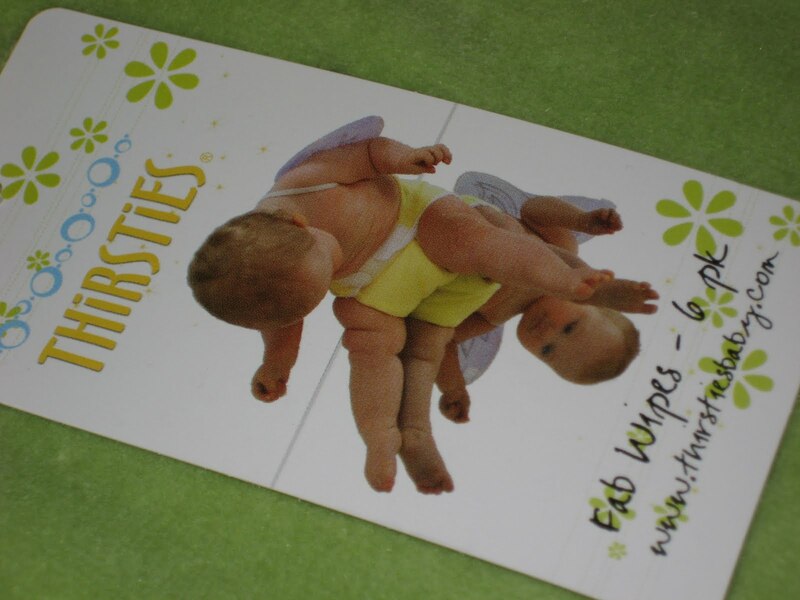 When I started cloth diapering, using disposable wipes got real old, real fast. I kept wanting to ball the wipe up inside the diaper like I did with sposies. It was a pain to remember to pick them out and throw them away! When I ran out of the disposable wipes I had, I cut up some burp cloths that were laying around. I didn’t like them as burp cloths because they were very thin and washcloth-like. I doubled them over and zigzagged them. Not easy since they were super stretchy! Not only are they not pretty (LOL) but they’re actually kind of scratchy compared to materials used in cloth wipes. I also don’t always have enough since I don’t have to wash every day anymore. I was finding myself using several for a diaper change and having to scrub a little bit, which isn’t fun for my little guy. I really wanted cloth wipes, but I was kind of scared to buy some and not like them. I wanted to find a brand I liked, and buy a nice pretty stack of them, rather than have a mismatched collection! I’ve heard Thirsties talked about in my cloth diaper groups. Both the Duo Diapers and the Duo Wraps came up an awful lot when I was asking other cloth diapering mamas about night time diapering. I haven’t tried either of those yet, but Thirsties agreed to send me a 6-pack of their fab wipes and a 4 oz. (travel size) bottle of their booty luster wipe spray. There’s a giveaway too, so keep reading! 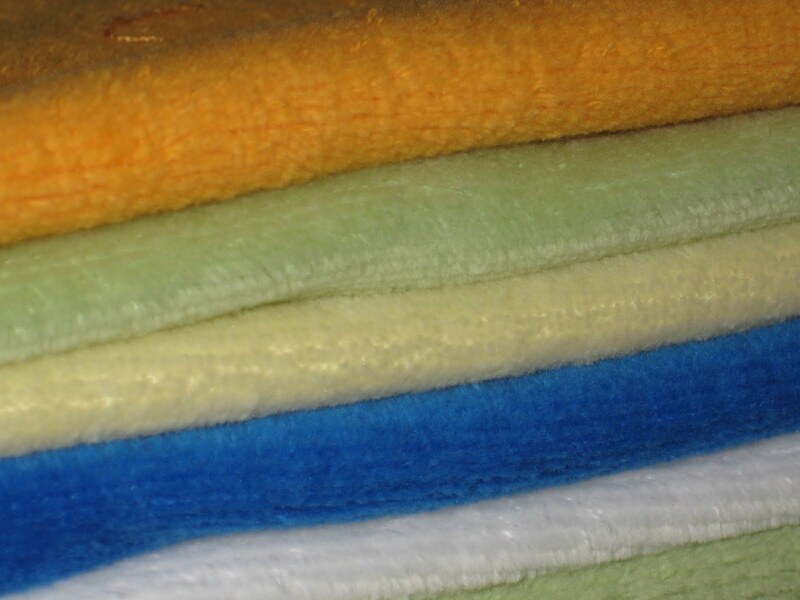 The wipes are cotton velour on one side and microfleece on the other. Both sides are super soft and the white side is nice to be sure you got the tushie clean. 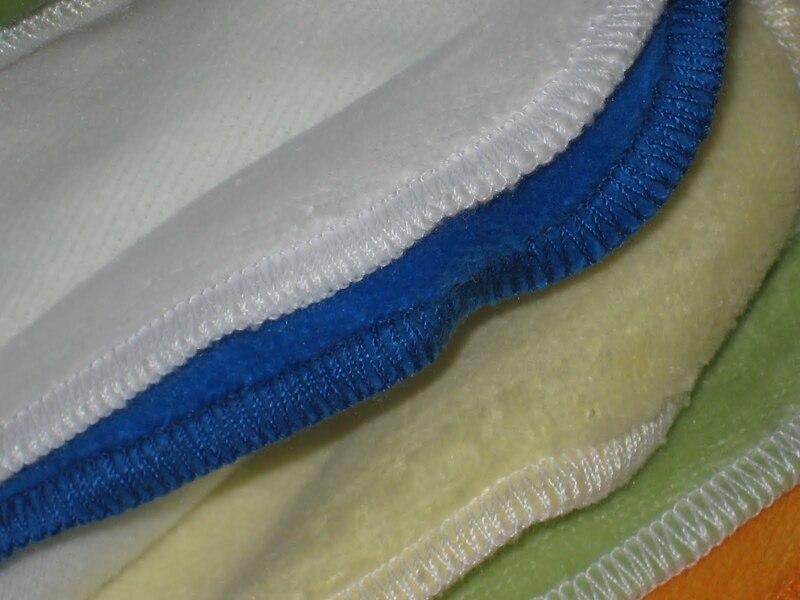 They’re 8 x 8 (after washing and drying) and will fit in a wipes warmer or empty wipes container. The washing instructions say to dry on low, but I dried them on high with my diaper inserts and had no trouble. I seemed to use a zillion wipes, but let’s just say 15 per day for simplicity here. That’s a cost of about $9 for a month. If you’re buying smaller refill packs or tubs, not shopping sales and clipping coupons, your cost per wipe will be a lot higher. For me, a 6 pack of thirsties wipes ($10.75 MSRP) would pay for itself in just over a month. So even if I had bought three dozen wipes, they would have paid for themselves by now. 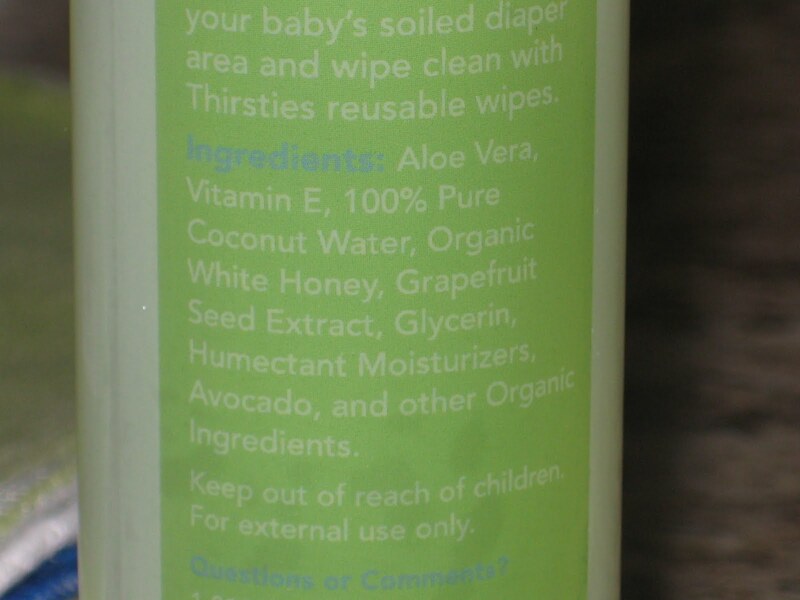 I’ll just skip right over the issue of ingredients in disposable wipes and impact on the environment and add that based on the reviews I’ve read, people continue to use these wipes long after their kids are out of diapers. Wiping faces, cleaning the house. Let’s see you do that with a “used” disposable wipe! The compulsive side of me feels the need to point out how nice and pretty they look stacked up all nice and neatly. I had to run a quick load of diapers to avoid using those nasty burp cloth wipes on him! I want to buy 3 more packs of these. I think that would give me enough to have some upstairs and downstairs, not have to wash every day, and be able to ditch the burp cloth wipes! The Booty Luster ended up being a whole lot nicer than I expected. To be honest, I thought it was going to be a pre-mixed, overpriced version of every other wipes solution. Sorry, I was wrong! The ingredients are: Aloe Vera, Vitamin E, 100% Pure Coconut water, Organic White Honey, Grapefruit Seed Extract, Glycerin, Humectant Moisturizers, Avocado and other Organic Ingredients. The “other organic ingredients” is a little bothersome to me. Edit: Those “other organic ingredients” are just purified water, so no worries! Anyone who has experience with food allergies will tell you how irritating listed ingredients like “natural flavoring” can be! My son doesn’t have any topical allergies that we know of, so I didn’t pursue this. I do like that it uses Grapefruit Seed Extract as the anti-fungal ingredient, rather than Tea Tree Oil. I’m used to squirting away and wiping, squirting some more, wiping etc. I had a hard time getting used to needing only 2 squirts of the booty luster. My son’s tush wiped clean easily, felt smooth and clean, no residue at all. The spray came out with just the right mist, though we did have a few drips. The scent was very light, but pleasant. Like a very light, summery citrus. The MSRP of the 4 oz travel size bottle is $6.25, and the 8 oz bottle, $11.00. That’s a little spendy for cough*cheap*cough, ahem, frugal me. However, using the math I did earlier, this would most likely still be cheaper than disposable wipes and very convenient to boot. I’m not sure how long a bottle will last, I’ll have to update on that. If I can get used to only needing two squirts, it will probably last a long time! If you want to drool over all Thirsties has to offer (and maybe leave a not so subtle hint with some dog-eared pages), you can request a catalog on their website. Just go to www.thirstiesbaby.com/catalog.htm. Want it? Find a retailer at thirstiesbaby.com. Or, win it! Thirsties is sending one lucky blog reader just what I got! A 6 pack of fab wipes (your choice of boy or girl colors) and a 4 oz. bottle of booty luster! U.S. Residents only. Please be sure to leave your email address in at least one of your comments if it’s not visible in your profile. If you win and I can’t find contact info for you, I will choose another winner. 1. Visit http://www.thirstiesbaby.com/ and tell me what else you’d like to try. 2. Follow my blog publicly. Current followers count, comment saying you’re a follower to get your entry. 4. “Like” Thirsties on Facebook. Same as above. Current likers/fans count & leave your comment to get your entry. 5. Follow me on Twitter. Current followers count, comment saying you follow to get your entry. 6. Tweet about this giveaway. Please include @chgdiapers and link to this giveaway. You may use this example if you like. “@chgdiapers is giving away Thirsties wipes and Booty Luster until 5/14 http://bit.ly/dsSyLJ #clothdiapers #giveaway” Limit one tweet per day, please comment with the permalink to your tweet for your entry. 7. Blog about this giveaway and link back to it. Leave a comment with a link to your blog post for your entry. Then do the hokey pokey and turn yourself around while patting your head and rubbing your tummy and…ok that one was just for fun! I will accept entries until Friday, May 14th at 9 P.M. I will use random.org’s true random number generator to select a winner. I’ll notify the winner by email and s/he will have 48 hours to claim the prize! >I need to get a duo diaper. Love the microfleece liner dipes! >I follow you on twitter now, too! >I would like to try a duo diaper. I have some fab wipes and would LOVE to have more! >I would like to try the Thirsties Duo Diaper with snaps or a Duo Wrap (cover)in prints. Too many choices. >I'd love to try their super wash. I've heard good things. >I have yet to try thirsties but have been hearing good things. I would like to try the duo wrap & duo cover. >I like the thirsties diaper covers. >I "liked" Thirsties on FB. >I "liked" you on FB. >I'd love to try one of the Duo wraps as I'm venturing into the prefold world! >I love the duo covers and diapers!! >The ocean blue duo wrap! I'd like to try cloth diapering – I'm just a little scared to start! These sound great though! >I am a thirsties fb fan. >I would love to try the duo! >i follow you publicly w google! >i like you on face book!!!!! >I would like to try thirsties duo diaper. >I "like" you on FB. >I'd love to try the doublers. My baby just started wetting really heavily while she sleeps.BTW, I made my own cloth wipes out of flannel receiving blankets. Very soft, and nice as tissues when your nose gets really sore from a bad cold, too! >Just signed up to follow the blog publicly. >I want to try the Duo Wraps! >and I would probably want a diaper duffle or I'd try fab fitted…but those cloth wipes are really appealing! I was/am trying to make my own out of the super soft fabric, but it's very time consuming! >i "liked" the thirsties page on facebook. thanks! >i checked out the thirsties page and would love to try the duo diaper. i've never tried any of their diapers yet, but the duo is very appealing! i would love to win these wipes…i haven't yet tried cloth wipes (i make mine own disposable wipes), but i've really been leaning toward it. thanks for the chance to win! >I like thirsties on facebook! >And I follow you on Twitter. >I really want to try a Thirsties Duo. I LOVE LOVE LOVE my Thirsties covers! They are my favorite and I recommend them to ALL of my CD friends! >I like Thirsties on facebook. >I also follow your blog. >I'm a new fan of Thirsties on FB! >I've had my eye on a thirsties duo diaper for a while now. I'm also FRUGAL though, and typically only buy used diapers, so I don't have one yet! I have been holding out on doing cloth wipes b/c it seemed like a pain in the rear, but throwing the diposable wipes in the garbage is a pain too. This post has me convinced that I need to try it out! Thanks!